Get everything you need to review for the NCLEX-PN exam from one trusted source! 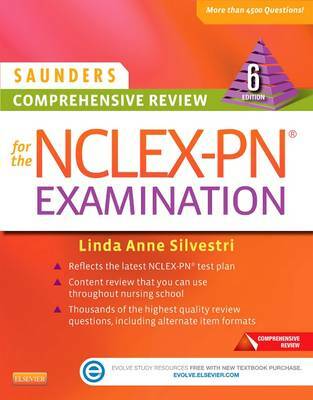 With over 4,500 high-quality review questions, this unique, bestselling review and preparation guide offers the perfect combination of core content review, comprehensive rationales, and detailed test-taking strategies from the NCLEX expert herself: Linda Silvestri. Updated to reflect the latest NCLEX-PN test plan, this new edition and companion Evolve website help you hone your understanding of all the important NCLEX-PN content areas. Full-color design makes for a more visually engaging learning experience. 12 pharmacology chapters address the emphasis on pharmacology questions on the NCLEX-PN exam. Priority Nursing Actions boxes outline and explain clinical emergent situations requiring immediate action, including detailed rationales and textbook references to help you strengthen prioritizing skills in clinical and testing situations. Pyramid Alert boxes reinforce learning of essential content frequently tested on the NCLEX-PN exam. Reference to a Mosby or Saunders textbook gives you resources for further study and self-remediation. Question codes categorize each question by cognitive level, client needs area, integrated process, clinical content area, and priority concepts to allow you multiple study and exam selections on the companion Evolve site. Inclusion of all alternate item formats (multiple response, ordered response, fill-in-the-blank, figure, chart/exhibit, audio, and video questions) offers practice with mastering prioritizing, decision-making, and critical thinking skills, and help prepare you for this additional component of the new test plan for NCLEX-PN. Pyramid to Success sections supply an overview of the chapter, guidance and direction regarding the focus of review in the content area, and its relative importance to the most recent NCLEX-PN text plan. Pyramid Points identify content that typically appears on the NCLEX-PN exam. Pyramid Terms give you a quick review of each content area. Introductory chapters on preparation guidance for the NCLEX-PN, nonacademic preparation, test-taking strategies, the CAT format, and the NCLEX-PN are presented from a new graduate's perspective. Companion Evolve site allows for automatic software updates to allow you to check for changes and updates to content or functionality throughout the life of the edition. NEW! 4,500 test questions on the book and Evolve site. NEW! Incorporates the new NCLEX-PN test plan to familiarize you with newly added content you may encounter on the exam. A detailed test-taking strategy for each question gives you clues for analyzing and uncovering the correct answer option. Rationales are provided for both correct and incorrect options. Special text highlights specific test-taking strategies, and specific content areas in the practice questions provide you with guidance on what topics to review for further remediation in Saunders Strategies for Test Success: Passing Nursing School and the NCLEX Exam and Saunders Comprehensive Review for the NCLEX-PN Exam. Comprehensive exam consists of 85 questions related to all content areas in the book to represent the percentages identified in the NCLEX-PN test plan. NEW! Critical thinking What Would You Do? boxes keep you thinking as you review content. Answers at the end of the chapter reference an Elsevier book for further remediation. NEW! Testlet questions familiarize you with a new alternative item format question type expected to appear on future NCLEX test plans. NEW! Priority concept codes added to each question reinforce the concept-based teaching method.